Prep Time: 20 Minutes. Cook Time: 50 Minutes. I love the spicy flavors of Buffalo chicken wings, but I usually only have them when I'm dining out. Making wings at home can be messy, but by using a store-bought rotisserie chicken with these quesadillas, I get all the same flavors but none of the mess. 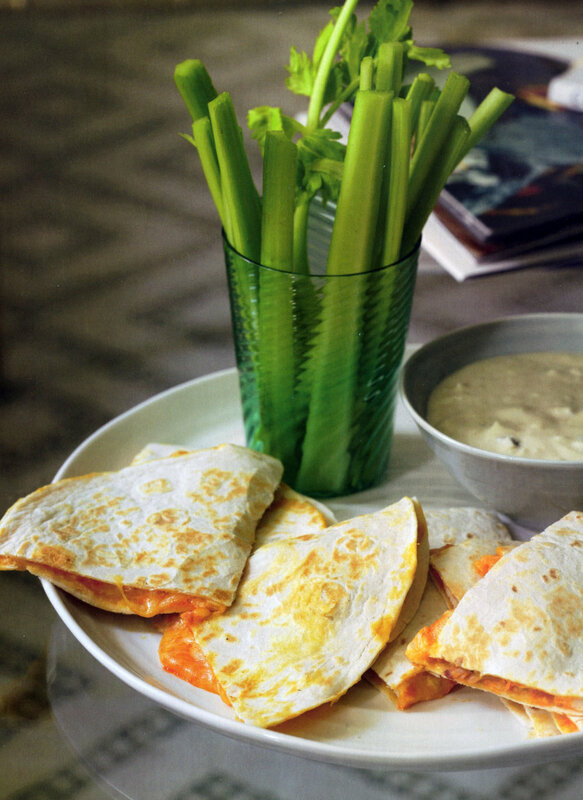 I like to serve my quesadillas with blue cheese dressing and celery sticks. In a large bowl, combine the chicken and sauce and stir until evenly coated . Add the cheese and toss to combine . Evenly divide chicken mixture on 6 tortillas and top with remaining 6 tortillas. Heat a large skillet ove r medium heat and coat with nonstick cooking spray. Cook the quesadillas, one at a time, about 3 to 4 minutes per side, using a spatula to turn. Cut into quarters and serve with blue cheese dressing and celery sticks on the side.